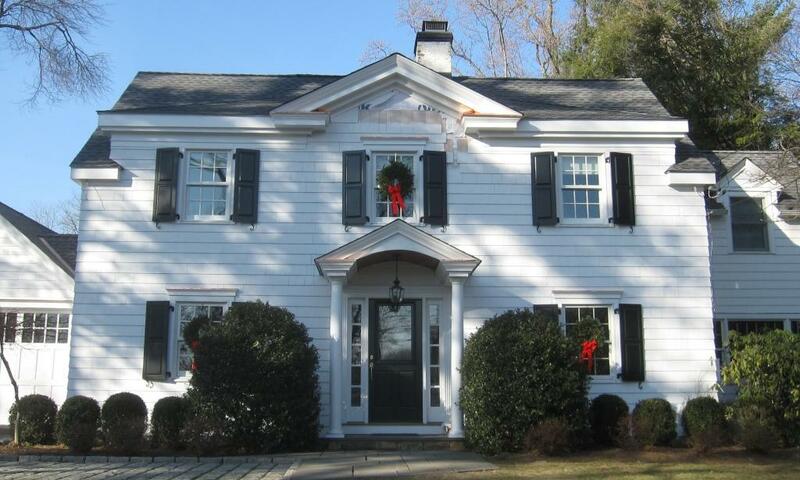 Westport House Make-over 12/19/2011 | Joseph Bergin Architect P.C. The homeowners asked me to visit their house on Long Lots Road in Westport, CT to discuss various alterations they were considering. We reviewed some interior alteration ideas, and then they took me to the front yard. They pointed to the upper windows of the house and lamented that because the eave was so low in comparison to the window heads, the whole house seemed to be diminished. Also, because the windows interrupted the eave, the front facade was forced to host four separate downspouts, a condition that certainly cluttered the facade. They asked me if I could envision a solution that would eliminate downspouts and bring a stately elevation to the facade…without getting too involved in altering the house. There are many types of building projects, and I welcome them all. But there is a special enthusiasm I reserve for these kinds of projects. By that I mean a small project with a limited focus requiring that a prickly problem be solved in an elegant way. An idea I described in the driveway that day is the ‘make-over’ that ultimately materialized. 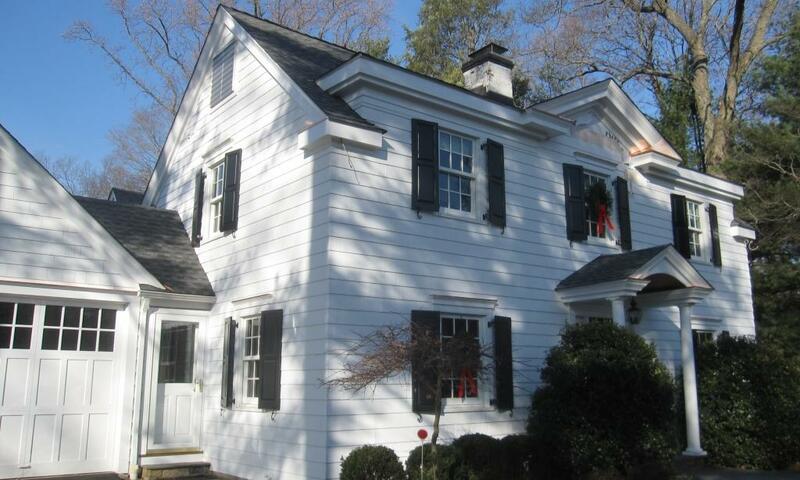 In short, a hip roof was built over the existing roof to incorporate the three existing dormer windows, with a pediment over the center window. The ticklish part, I thought, would be in how the new hip roof and the existing gable would relate to each other. 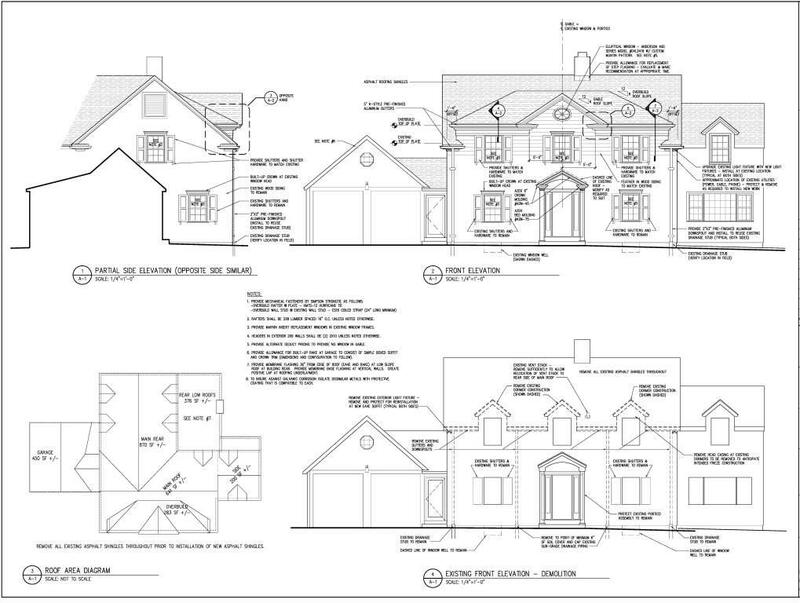 Above is one of our construction drawings for this project. We began designing in March of this year, but circumstances led the Owner to put the project on hold until October, when it recommenced with urgency. We were able to produce detailed construction drawings in short time and the construction, which commenced in early November, has been proceeding at a very good pace. The photograph above was taken on November 30th. The framing is completed and sheathed and the new eaves and rakes are constructed. The portico at the front door has received its new trim. The builder works in a very cooperative way and agreeably constructed a small mock-up of the frieze trim (you can see it just above the upper window that is closest in the photo). This helped the homeowner to gauge the appropriateness of the frieze board’s scale, as there was concern during the drawing review that the frieze might be too ‘heavy’. While I felt confident, I asked the builder to mock it up so that the homeowner could feel assured before any meanigful trim work was performed. The photos below were taken yesterday, December 19, 2011. The work is almost complete. Remaining work includes installation of gutters and downspouts, oval window in the pediment, light fixtures at the eaves and minor shingle siding infill at the gable. We will post photos again at completion. 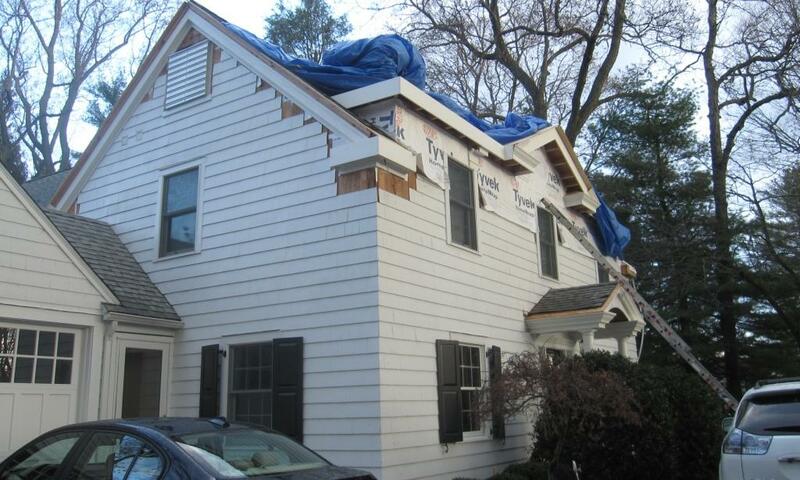 Great way to rectify those pinched and unfortunate dormers. It looks like the way it should have been to begin with. Great Job Joe. Tom, happy to hear you feel that way! Thanks for your comment!